Californian company Nektar has announced details of the Panorama P6, an extended version of its impressively well-integrated P4 Reason controller. 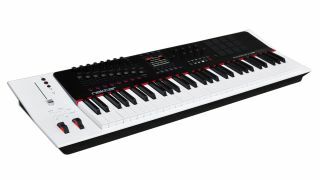 The P6 features the same four-mode control surface with mixer section, drum pads and transport controls, but adds an extended 61-note weighted keyboard. The unit also features a variety of other feature and integration tweaks - check out the press release below for more details. The Panorama P6 is due to start shipping Dec 2012 with an RRP of £419.99/$659.99. Nektar announce Panorama P6, a 61 note USB MIDI controller keyboard with the same deep Reason integration as their acclaimed Panorama P4. Panorama P4 first shipped in June 2012 and has already become a favorite among Reason users who are looking for great integration with hardware and workflow that allows uninterrupted creative freedom. Like the P4, the Panorama P6 features 4 modes that allow the user to switch between Mixer, Instrument and Transport mode and a 4th Internal mode with 20 user presets each configurable for control of external hardware, ReWired DAW's or other software. A motorized fader, solo and mute buttons give channel control in every mode as does the extended transport buttons with no less than 11 functions a button push away. 16 encoders, 9 faders and 9 LED buttons do most of the controlling with parameters and values displayed on the TFT display. All assignable buttons including the 11 function keys and 12 pads can be setup to send MIDI messages or QWERTY macros, a unique Panorama idea where up to 8 computer keyboard shortcuts can be sent with just one button press. In addition the Panorama P6 features a 61 note velocity sensitive semi-weighted keyboard with after touch, pitch bend, modulation wheel, MIDI out, foot switch and expression pedal sockets. Kong pad 1 can now be triggered via the foot switch socket. A unique Looper addition to Transport mode. With the looper active the pads act as an array of loop markers automatically set across a Reason song at an adjustable loop length. Hitting a pad will move Reason's Left and Right locator points to the positions corresponding to the pad. Pressing Panorama's "Go to Left marker" button will immediately move playback to the new position. The Looper is a great way to navigate Reason while building up a composition from Panorama but also allows for real-time performances or on the fly experimenting with the organization of Reason songs. In addition Panorama is regularly updated to include support for the latest Reason Rack Extensions. A downloadable update containing all the additions and improvements will be available to existing and new registered Panorama users from mid December 2012.